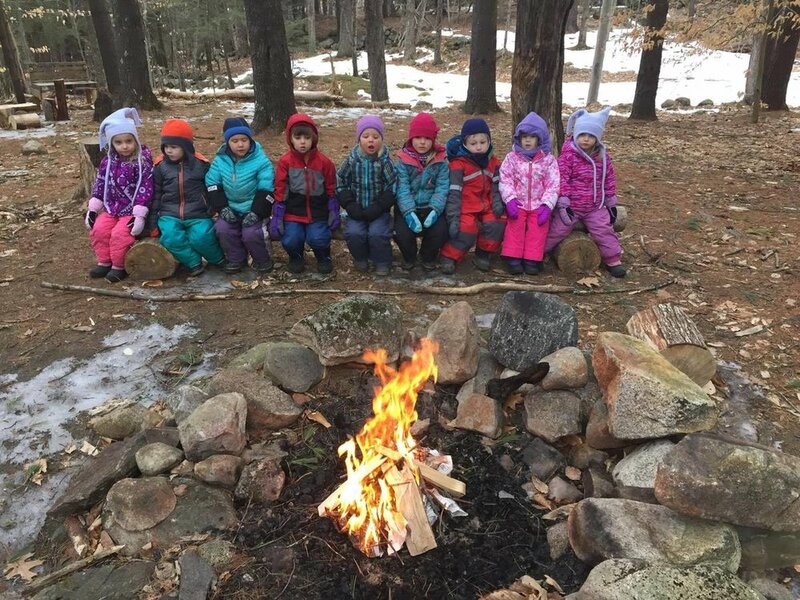 Fire and Ice and camping…oh what a day! We experienced some brief icing this morning and while it was a little damp, it certainly did not keep us down. The day just flew by! Waiting for the children this morning, was a camping tent, which they just loved. And it was so nice to have the children jump in and help with setting up the second tent. They knew how to help, where to push to get the poles in and most of all, how to enjoy this special piece of equipment. We let the children explore the use of the tent that best fit their play needs. Some read books inside, some played “tent” with their friends and we even read a book about camping while in the tent. It might just barely be the month of March, but it’s never too early to brush up on our camping skills! Heading out to the “Meeting Area”, our designated spot at the fire pit, we tasked the children with finding small sticks, no larger than the size of a cheese stick. We talked about how a small twiggy fire is just the right size for us. If fire is the equivalent of an outdoor television, it sure did the job of sucking in the attention of each child for a while. Overall we spent a solid thirty minutes on talking about fire safety, including match and lighter safety. We explained to the children about the importance of not playing with lighters or matches and if we saw other children doing so, that they needed to seek out an adult immediately. It is obvious that many of the children have had some sort of safety conversation about this topic and they openly shared with us this information. Having a safety ethic is an important part of our day to day lives and certainly at any age it’s a conversation we need to keep going with our children and families. The snow is almost gone around the lodge and there is a fair amount of ice around. Although, the children (and yes the teachers!) would love a little more snow on the ground to play in, we will take our outside time anyway we get it! Mud season is upon us! We will surely come home muddy and dirty and that is at the very core and foundation of free play. Within our free play at Nature Preschool there is also a fair amount of “pretend” play. It’s really fun to listen in and watch this action take place. Mostly the children are playing “house” or “family”. “Play is so important to optimal child development that it has been recognized by the United Nations High Commission for Human Rights as a right of every child” -www.unhchr.ch/html/menu3/b/k2crc.htm. While we may subtly jump in at times to redirect play in cases of safety or unkind actions, for the most part we leave each child and situation to develop in its natural state so that each child is valued for their work within their play. We find that this values the integrity of the individual child and opens the doors for place based education to unfold in an organic process. So let’s just outside and play! Here in the first week of March, life in the outdoors is starting to happen! So In closing, I will bring you a weekly report as recorded by Northern Woodlands Magazine. “Days are longer, the sun is stronger, and turkey vultures are here, seeking roadkill. They prefer to eat animals soon after they have died but they can metabolize bacterial toxins, allowing them to feed on carrion in a fairly advanced state of decay. Other scavengers are turned off sooner. Black, withered stalks of last year’s Indian pipe may still be erect. Most of last year’s cattails have broken off, adding material to the soil at their feet” – Northern Woodlands: The Outside Story.